Fire Shield products are ideal for home, office, and campus environments such as residence halls, labs, classrooms, libraries and other facilities. Fire Shield cords, with specially designed shielded conductors, are able to detect series faults and line-to-neutral faults, significantly reducing fire hazards. Available as power strips and surge protectors. 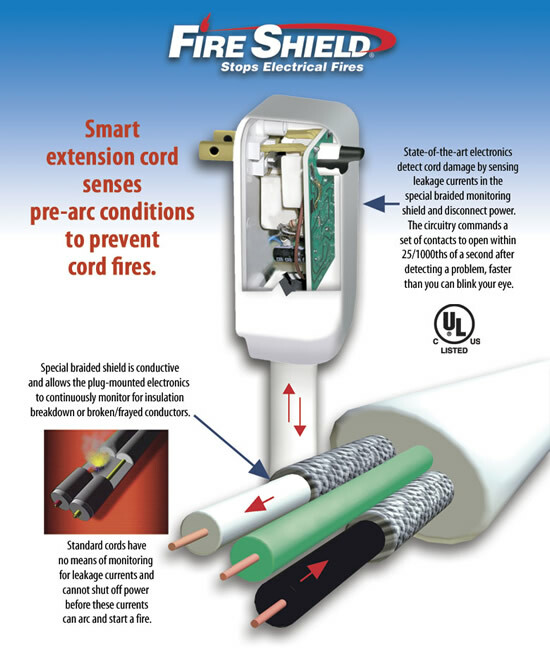 State-of-the-art electronics detect cord damage and disconnect power in 25/1000 of a second, preventing cord fires. Every six minutes there is a cord-related fire in the United States.